We’re letting one nurse take over a segment our blog. Wait a minute, why? Well, we want to give you, and other student nurses, an open and honest look at life beyond nursing school. From studying for the NCLEX Exam and passing it to the job hunt and the day-to-day of a new nurse, you will be able to follow the ins and outs, the ups and downs. 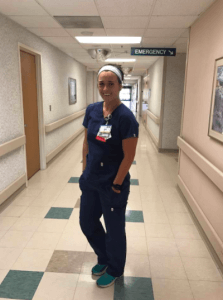 Allow us to introduce you to Savanah Case, RN, BSN. You may remember her from our “What End-of-Program Nursing Students Wish They Knew When…” blog series. She was in your shoes not too long ago and is full of stories, advice and tips that you will want to know. Hello all! My name is Savanah Case RN, BSN (those letters still seem surreal to write after my name). I am currently working in the Mother Baby department at Olathe Medical Center’s The Birth Place. I have been done with school for a whole six months now and time has absolutely flown by. It wasn’t until the end of my schooling that I was able to narrow down the areas I hoped to obtain a job in – Mother Baby/Labor and Delivery or Emergency Department. Needless to say, I ended up at The Birth Place and have absolutely loved it for countless reasons. Throughout the next six months I will share my story and experiences with all of you, but first, I would like to dive into the test everyone begins to think about the minute they find out they have been accepted into nursing school – the NCLEX. Without passing this exam, I wouldn’t be able to do what I love – be a nurse. I attended a nursing school that used ATI within our curriculum. So, towards the end of my program we had to take the ATI Comprehensive Predictor, which from my understanding is very comparable to the NCLEX and calculates your probability of passing the NCLEX. The Predictor would be the longest test I had ever taken in my entire life and my ability to take the NCLEX depended on this. Needless to say, this definitely made me nervous. Once I passed the Predictor I had a big decision to make as to when I wanted to take boards. It’s a dilemma I’m sure all of you will face, and you will probably change your mind at least five times. The minute that you do commit to a date and click that “schedule” button, your mind will start to race. My advice is go with your gut – if you don’t like to feel rushed, give yourself time, and if you will put off studying if it’s too far out, schedule it soon! By this time in nursing school, you have an idea of how you study and how you work and test “best”. I decided the content was not going to get any fresher in my mind as time went on so I got on the website and booked the soonest NCLEX date I could get – May 9th. Sidenote: When scheduling your test think about the time of day you would prefer to test/your daily routine. Every morning before class I got up and went running, ate my breakfast and then hit the books – which is why I scheduled my exam for 7:30 AM. Testing at this time allowed me to wake up, get my workout in and eat my breakfast just like I normally would! However, if you’re not a morning person, I wouldn’t suggest testing early in the morning. So, how did I study? I mainly used two resources for my studying that I purchased on my own. There is no perfect time to study and let’s be honest, no one WANTS to study for the NCLEX but you just have to dive in! When I Started Studying:Around Christmas time, roughly five months before graduation, I bought the NCLEX RN app for my phone. Slowly, and I mean very slowly, I started taking questions on it. When I say slowly I mean the first two months I was lucky to take 10 questions before I went to bed – but some is better than none, right? This app has about 1500 questions you can take, and they even will split them into categories (Labs, Med/Surg, Maternity, Psych, Peds, Pharmacology, Fundamentals). On the app it will also show you the time you spend on average answering questions and how many you have gotten right. How I Prepped:Knowing that my goal was to take the NCLEX in May, I purchased the NCBSN five-week course and started to use it towards the end of April. I liked this option because the people that make the NCLEX make this study tool. Because of time purposes, I stuck to the quiz banks offered on this site and tried to take one full set a day for 10 days straight prior to my test date which was roughly 150-200 questions a day. Sidenotes: On these quizzes, I got anywhere from 40%-100%. So, don’t get stressed out if you aren’t getting high marks every time! How Many Hours I Studied: Timewise, I can’t put a number on how many hours I spent studying, but I know it was a lot. I am a “fast test taker” so the time spent was always different. Study until you feel comfortable or until you hit a wall. Once you hit a wall, step away for a bit and come back to it later once you’ve taken some time to relax! My Best Study Tip:Not knowing how many questions I would have to take during the actual exam, I tried to take as many as possible. When taking questions, I would suggest the “practice like you play” philosophy. (AKA: build your own testing environment). For me, that meant putting my phone away, finding a place where there would be no noise/distractions, no one else around and absolutely no resources! While you’re taking questions keep a blank sheet of paper nearby to write down topics that you might want to look over or review! SATA Questions: SELECT ALL THAT APPLY. If you don’t already hate seeing this (SATA), you will by the time you finish taking your NCLEX. My biggest suggestion is to get comfortable seeing this next to your questions and take as many as you can! I would say over half of my exam was SATA. The Final Check: I also ended up taking a practice predictor from the ATI website prior to taking my NCLEX. This helped me to gauge my overall competence level, and it gave me another set of NCLEX-style questions to practice on. Overall studying wise, I knew that I personally needed to take practice questions, which is why that was more of my studying method. I did review some content, especially if I wrote it down when taking questions. You will constantly feel like you’re not studying enough or you may not feel confident that you’re studying the right way. You will probably never feel that you are “prepared” for this test, but in all reality, you’ve been preparing for two years. The day before the test, take it easy and try to relax (HA! Easier said than done, I know). But seriously, try to schedule something fun to take your mind off of it and then get to bed at a decent time. At this point, you just have to accept the fact that you’re nervous. Embrace it! Testing day – I literally could. not. sleep. all. night. long. I tried my best to sleep, but I think I maybe got three hours, whoops! I had my roommate take me to the test, drop me off and made plans for her to pick me up. This made it easy for me to stay “in the zone” that morning. During the test, I tried my best to stay calm. There were questions where I had no idea what was being asked and there were questions I knew the answer to almost immediately. While you’re testing, stick to the way you test. If you take your time answering questions, don’t rush into one. And if you seem to move through questions faster, don’t completely change your style! When my screen went black, (I didn’t believe this actually happened, until it happened to me) I had no clue what to do. I thought, “That’s it? Am I done? Is this a joke?” And just like that, the waiting game began….. If I’m being honest, I remember walking out feeling like I was in a daze, almost like I felt nothing, if that makes sense. However, the more I started to think about it, the more confident I felt that I had in fact passed – but I still had no idea. The first 24 hours of the waiting game I felt as good as you can try to feel, but the second 24 hours is when the doubt set in. This is when you start wanting to Google those “tricks” to see if you had passed because you’re too impatient to wait the whole 48 hours. Luckily, I talked myself out of attempting any of those tricks and just kept waiting. I remember sitting on my bed at 47 hours and 55 minutes watching the clock, and the clock moved slower than ever. Finally, I was able to pay my $7 to receive early results and saw the word “Pass” in really small letters …yes that’s it. Balloons don’t trickle down your screen, the word isn’t in bright colors,“Congratulations!” doesn’t flash across your screen, it just says just “pass”. Nonetheless, I cried tears of joy and screamed so loud people thought I broke my leg. So that’s it, that’s how I passed the NCLEX in 75 questions. The emotions, the stress, the hard work, and the excitement. What’s up next? I’m diving into my experience with the job hunt, resume tips I used and how I prepared for the first day on the job.